Have you ever had a day from hell? I’ve had a few of them. There’s the time I got locked out of my running car in the middle of a dangerous neighborhood during a snowstorm. And I had to wait outside with no jacket for six hours. Then, there was the day I had to fly on an airplane with diarrhea and the flu. And somehow, I fell asleep on the floor of the airplane lavatory with my cheek resting on the toilet seat. And yeah…the flight attendants had to wake me up. I had a big ring on my face. A more recent tragedy happened when I started taking a new medication for my Rheumatoid Arthritis that has the possible side-effect of causing people to pass out. Of course, it also has the possibility of causing diarrhea on an airplane; but, I’m already accustomed to that. “It won’t happen to me!”… until it did, only a couple of hours before I had to speak to an arena full of women who were gathering at a convention center. While passing out, I managed to strategically face dive into the bathroom cabinet and broke my nose and caused my front tooth to go all the way through my lip. Of course, I didn’t have time to go to the E.R. to get stitches; and, I knew that many people had been praying and prepping for this event for over a year. So, how could I cancel? But the swelling was starting to make me look like I had fish lips. And I was more concerned about the uncontrollable drool that dripped out of my mouth. I looked like a toddler who got out of control with mom’s lipstick – neither of which look good when magnified on a jumbo video screen. You see, at some point or another, all of us are going to ask: “Why me? Why this? Why now?” Our plans will fall apart. And with every head turn, drool is going to fly out in the direction of friends and family. So, what do we do? 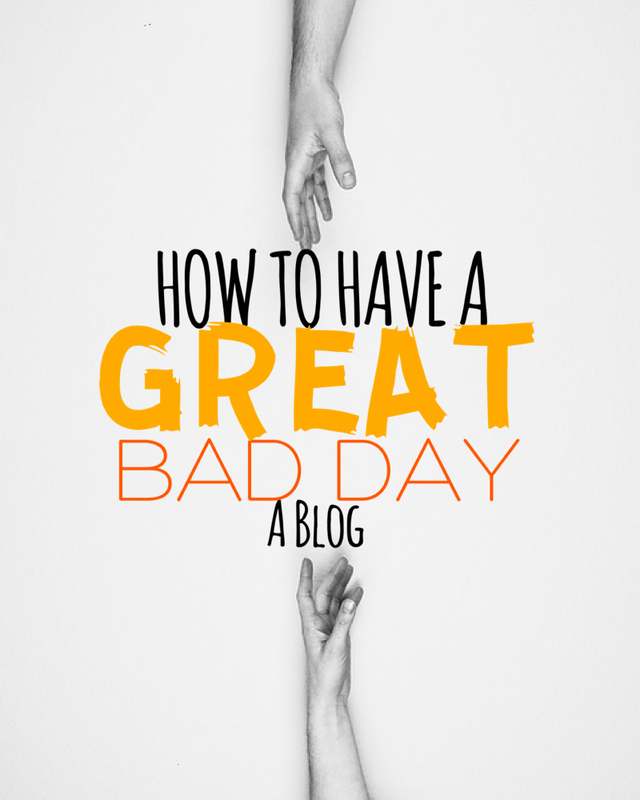 How do we have a REALLY GOOD bad day? Well, God gives us a hint in Acts chapter 16. In Acts 16, we read about Paul and Silas getting unjustly thrown in jail. This wasn’t some comfy overnight lock-up. They had been “severely flogged” and beaten with rods. Their backs were bleeding. And they were chained to the wall with shackles in the inner jail – a dungeon spot reserved for the worst of the worst. Yet, what the Bible says about them is: verse 25 says, “About midnight Paul and Silas were praying and singing hymns to God, and the other prisoners were listening to them.” And against all odds, an earthquake suddenly shook so violently that all the prison doors opened. And not only did they lead their jailer to Christ, but God supernaturally released them the following day. You see, the same principle plays true for you and me. Quite often, we believe that God loves us; yet, the shackles of our circumstances seem more real. But what can we do in the meantime? We worship. “Praise” is our best solution when stuck between Promise & Power. As a modern example of this, on our new Substance I/O album, I wrote a song called “Reality like you Do.” It’s a song of praise that I wrote on one of those really bad days. Of course, no matter what’s happening to you right now, the Bible assures us that, in heaven, everything is amazing. And Jesus taught us to pray: “Let your will be done on earth as it’s done in heaven.” i.e., We should pray that the realities of heaven would invade our earthly reality. And whenever we do, God has a way of turning things around for the good. So, back to my face-plant: Soon after my wife peeled me off the floor, there I was with a throbbing lip and a nasty headache. I could barely put my glasses onto my broken nose. And against all odds, I immediately felt the healing power of God come on me. It almost didn’t make sense. My swollen lip suddenly got super small. And the pain was almost non-existent only an hour after my fall. When all was said and done, I preached my heart out to those women and went home to rest the next day. And I’m convinced the power of God was all over me. But, for the sake of total transparency, the next day (after the conference ended), my lip swelled up like a balloon (along with my nose). I turned into a total gorilla. I even ate bananas (because my teeth were all loose). I have no idea why God seemed to give me a “temporary healing.” I have no idea why my lip didn’t swell up until all of my speaking engagements were over. And yet, by that point, it didn’t even matter to me because, I had nothing on my schedule and I was able to binge watch an entire season of my favorite tv show. Even then, God was with me. But my point is this: No matter what you’re going through right now, God longs to invade your reality with HIS reality. He may not do everything we want in the timeline that we want it; but, at the very least, he can give you a sense of peace and optimism no matter what’s going on. Because one thing is for sure: “[God] is an ever-present help in times of trouble” (Psm 46:1). He’s a God who “daily bears our burdens.” (Psm 68:19). So, Heavenly Father, be with us today. Our lives may not be perfect, but your peace is here. We receive it in Jesus’ name. Amen. You can find Substance I.O. on iTunes, Google Play, and Spotify.